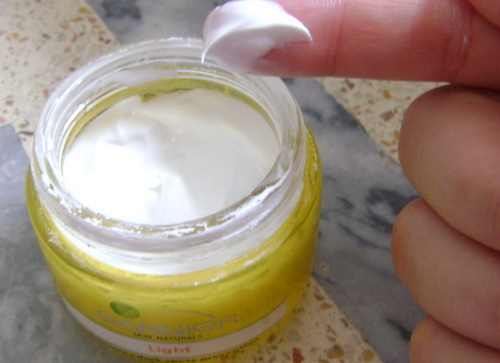 I'm so glad that I'm writing a review of Garnier Light SPF Cream. Sincerely I'm not very found of fairness products it's because I already have a very light skin tone, but the thing made me to use Garnier Light SPF Cream was a big ugly acne scare on my face. I have been trying to get rid of my acne scare for a long time. I had an acne problem in the past and it left a black spots on my face. I have had acne problem for about 2 years then I went to the Dermatologist after some treatment I was completely cleared of acne, but the black spots was still remained. lightens the skin, protects from UVA & UVB rays, and helps prevent appearance of dark spots. Pure lemon essence and Vitamin C to clarify and smoothen skin. Glycerin to moisturise and comfort the skn. Your skin looks naturally lighter and more even. It feels smooth and illuminates with a healthy glow. UVA & UVB filters to protect the skin from the harmful rays of the sun. A moisturiser that not only lightens your skin, but also helps prevent dark spots and skin darkening. I love the ultra-light texture shiny white looks like a melted pearls in a jar. It's non greasy quick absorbing and a little thick, but smooth and soft on skin. I have used many creams, ubtan, rose water etc over the years to fade the dark spots, but that mark did not fade. I came across to Garnier Light SPF Cream while surfing on google and started using garnier light and saw an improvement after 2 weeks. In the beginning it showed no results, but after some days I found that my black spot is fading and after a month it vanished completely. So if you’re looking for the best skin lightning and whitening product, this is your big chance for a cost-effective solution to dark skin pigmentation. what the product promises seemed just right for me. I am really happy that it suited you. :) You are right! It takes some time but it does lighten those ugly scars. I like it for that. glad you like it! thanks for sharing i should try this! Rubab i'm not sure about it will suit you or not i also have a sensitive skin but this thing does'n bother my face its bit dry really good for oily skin i suggest you to try this for some days if hurt your skin leave immediately.